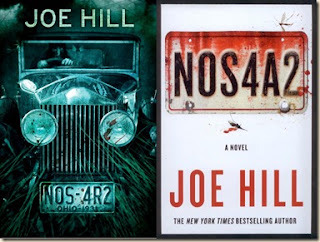 Fruitless Pursuits: Book Review: Joe Hill's "NOS4A2"
Resurrection, parallel universes, creepy bone hammers, rhyming minions, and a demonic Rolls Royce? Joe Hill's latest is deceptive, in a way. While the buildup is slow, the payoff is solid as we're introduced to the cast and setting of NO4A2, named after the license plate of Charlie Manx's 1938 Rolls Royce Wraith. Manx, you see, has a thing for kidnapping children and bringing them to "Christmasland," a place inside the United States (bearing a strong resemblance to Santa's Village in northern New Hampshire) but not quite inside the United States. The story spends a lot of introductory time with Manx, his minion, and with some of the kids in mind. One who got away is Vic, who probably saw some things she shouldn't, but got Charlie put in jail for the rest of his life anyway. But now Charlie's back? And he wants Vic's son? My only other exposures to Hill were Locke & Key, a weird comic, and Horns, which was a brilliant read. Both of those works, along with NOS4A2, have done a lot to change what my perception of horror as a genre is. Perhaps Hill is not horror the way his father, Stephen King is, but his books have a weird, Lovecraft/Howard/Clark Ashton Smith vibe to them that how I view horror doesn't. The book is really masterful both in its pacing and its reveals, with just the right balance of creepy and nasty. In a 600+ page book (especially when the previous book, Horns, was many pages fewer), you expect padding that wasn't there. There are hints to other books (heck, other authors), reasonable cultural and geographical touchstones, and plenty of nods to interests of Hill's himself, which are always fun Easter eggs to get. Does it suffer from unnecessary profanity and some stuff that seems gross or off-putting simply for the sake of it? Yes, of course, but given the genre, it's pretty expected and can easily be forgiven. The slow start might also be frustrating, but with how well it paid off and seeing the necessity for it? I have half a mind to reread the first 100 or so pages and see what I ended up missing. Honestly, and I don't say this lightly, this book might be a great crossover title for people who tend to like fantasy but don't do horror. It's not scary, but it's creepy. It's not disgusting, but it is strange. What I can say, however, is that it's pretty great overall, and opens some really interesting doors for Hill's future work as well. Don't skip this one. You'll absolutely regret it if you do. I had mixed feelings about Heart Shaped Box (enjoyable overall, but some issues). I loved 20th Century Ghosts and felt for a time that his storytelling abilities might be best suited to shorter works. This review makes me think otherwise, though. Sounds amazing!